Indians are delighted after seeing "selfie footage" from the country's heaviest rocket. 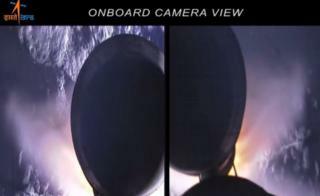 The onboard footage from the 640-tonne "monster" rocket, India's largest, has been widely shared since it was released by the Indian Space Research Organisation (Isro) on Monday. Isro often shares onboard footage from its missions. Its Mars Orbiter has its own Twitter account, where it occasionally shares pictures from the Red Planet. Isro's latest rocket, the GSLV Mark III, blasted off from a launching site off the Bay of Bengal in Sriharikota on Monday. The rocket, which has been compared to the weight of 200 elephants, or five jumbo jets, will reduce Isro's reliance on European vehicles to launch heavy satellites. It can carry a payload weighing more than three tonnes into the high altitude orbit occupied by the spacecraft that relay TV, telephone calls and broadband connections. But for now, Indians are simply ecstatic that the rocket took selfies.